Welcome to Stitcher's Guild Reloaded. Please login or sign up. What does SG do with $35.00 per year? -Brings together people from all walks of life who share a common love of sewing. -Pays the bills without selling or sharing any of your personal information. -Provides an ad-free experience for everyone. -Provides an up-to-date cross-platform venue that works on all your favorite devices. -Stores, protects and allows you to share your messages, posts, photos and tutorials. -Helps keep the community active and supports its growth. 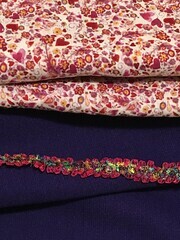 Pictures of the wool, an elastic trim I picked up, and the lining fabric for the dress. Whew - SG needed a bit of persuasion to post this, what a pity reasons not to post are adding up ! Hopefully the new version will restore our freedoms. . . Does this bring you joy, calm, confidence if not, try something else. Just a reminder: We've got @ 17 days left in this challenge - from the initial post in this thread. Some of the Quick of Sewing Feet among us might be able to make a dress or two in that timeframe! Quote I'd like to sponsor a Dress challenge - and follow Mudcat's lovely idea of awarding the winner(s) a little $25 gift certificate at an appropriate fabric store/site. I would supply the gift certificates; the same caveat that Mudcat provided applies, it has to be website or store to which I can set up the gift certificate for the winners. To repeat: Two winners, one for each category, each getting a $25 gift certificate. I am copying and posting again the information about "entering" your garments, just in case anyone missed it. You can crop off "heads" (I always do!!!) but otherwise the photos of the dress should be the dress on a person. The "name" of your creation, could be anything from CCL V9428 to CCL's Hippie throwback - Keep in mind that this is the name we will use in the poll for voting. The "new thing" - fabric, pattern, technique etc. 12-22-18 through 12-31-18: Everyone can vote on their favorites in the two polls -in the Beginner to Intermediate and the Intermediate to Advanced threads. Edited to add: Wendy -- your fabric combination is exciting and looks terrific. Our furnace went out yesterday, and frankly I wished I had your purple wool "jumper/pinafore/whatever" to keep warm. The Things that Make us Happy Make us Wise. I doubt I will be able to complete this challenge but I found some great fabric for my Rivermont dress. 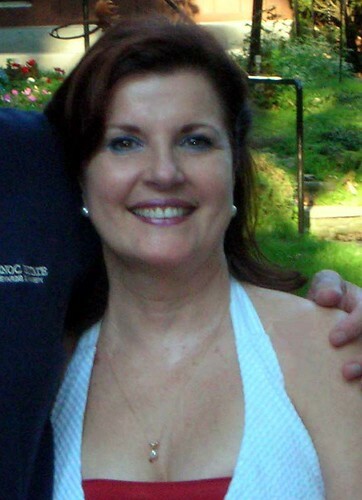 Recoverying from Mar 18 total hysterectomy and cancer removal surgery. Bev, I'm sorry your dress didn't work out. B, that fabric looks lovely! Indigo, I am not speedy either, but I hope we can keep plugging along. I have been making steady progress, I'm at the point of burrito rolling the lining, I'm a little nervous about pulling all that wool fabric through a tiny tube, so I'm sitting and thinking about it instead! Its probably the best way to make a clean arm hole though. Hope to have the dress totally done by next weekend. Indigotiger...strange as in new to you oddity or strange strange?? Asking because sometimes when I try something new to me it registers as strange until it settles... Boy, did that sentence not come out right. Hope you know what I mean. Off topic...well sort of related. I may be picking your brain about your popover dresses. A friend gave me one a while ago. It's a little outside my comfort zone (i.e. strange) but I found I like it and am wearing it a lot. 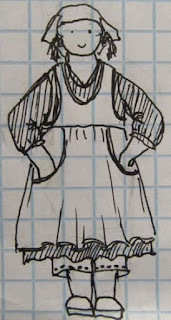 I have some wool that could become a reversible dress...a bit inspired by Wendy here, but single layer. I have ideas percolating about armhole and neckline finishes that I will start posting in the Dress a Month thread later this week and not take up space here, but would love ideas about how to keep it simple and reversible. BinMi, that fabric looks great. Linen? Wendy, I really like those colours. Purple in one of my two favourite colours... Fun trim. CCL, what better than have a gifted dress have you try out something new. And as it seems to work, a great win! I actually started another dress today, for christmas. Very easy one - it is the Kendosa top from Silhouette patterns. It consists of two layers, a normal sleeveless top plus a wide kimonosleeved overshirt. I lengthend the underlaying tshirt part to knee length as to have it a dress. The overlay is dark blue velvet, the underlayer dark blue viscose knit. The sewing bit is almost finished, but I want to sew on trim on the hem of the overlayer. I will finish it probably at the weekend. My "wearable muslin", the toile in brown/white shot linen is a definite success and will probably become part of my winter 6PAC. 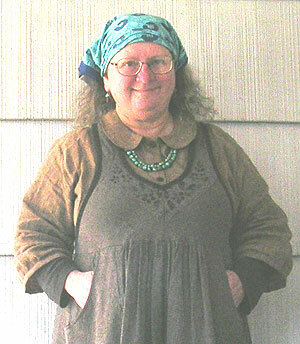 I started with my TNT everyday dress pattern bodice, which has a bias front, a "U" neckline, and a straight grain back. I raised the neck to just below a jewel neckline, added a button placket, drafted a peter pan collar, altered the back to have a yoke and side back pleats, and added integral sleeve gussets. I am fairly active, and ride my bike a lot, so garments that let my arms move freely are important. Figuring out how to draft the peter pan collar was a bit mind bending, and the pattern piece has a slightly odd shape, but when it is attached to the bodice, it looks just right and fits neatly around my neck without being too snug. I still need to do the buttonholes and sew on the buttons. Photos when it isn't nighttime. I love to sew, pure and simple. Morzel, I hope the velvet overblouse slips easily over the jersey under t-shirt dress. Sometimes when working with a velvet overlay I find it likes to creep up as I walk. Not a flattering look. I'm sure yours will work out just fine, though. B in Mi, tell us more about that beautiful piece of fabric that you found for your dress. What type of fabric is it? It's going to make a really stunning dress, with all that high contrast going on. Indigotiger, your dress is looking great. You're such a clever engineer when it comes to making patterns work for you. That Peter Pan collar looks perfect. Wendy, congrats for soldiering on with the dress. Bit by bit it will all come together. That burrito method makes such a nice finish. Actually rather like a smock/shirt/blouse, as it is large enough to easily wear a knit top underneath, which is ideal for wintertime. And it is obvious why I want to put some more attention into adjusting the sleeve pattern. The fabric is a double knit, poly/rayon/spandex. I got it from Stylemaker Fabrics. It is called Distressed Navy Chevron, color is navy and vanilla. If I don't end up making the dress, it would make a cool jacket. Indigotiger, your dress toile is coming along nicely! Fall down eight times. Get up nine times. Cool stuff is going on here! indiotiger: That photo of you is so cute and Lisanne is spot on about the interesting use of grain. indiotiger, the detail on the neckline looks awesome. Good job. Thanks all, for the compliments! Changing up my former plan somewhat, as I screwed up on the what gets sewn when, and already sewed my brown/white shot linen blouse as my toile for this challenge, instead of remembering to choose a non-SWAP fabric. This means that my indigo pinstripe dress cannot also be sewn before the 26th. Sigh. Still going to sew the dress, but I can't have two "sewn after the rules but before the 26th garments. Ooops! Changing up my former plan somewhat, as I screwed up on the what gets sewn when, and already sewed my brown/white shot linen blouse as my toile for this challenge, instead of remembering to choose a non-SWAP fabric. I've done this plenty of times too! I can't keep it all straight sometimes. Your color palette is so well coordinated though, at least you can substitute out a different fabric! The plan for the weekend is to hem the lining and dress, and possibly to edge/top stitch the neck opening. Then I need to decide if I am going to embellish the dress, or leave it as-is. Interestingly, a friend of mine sent me a picture of myself in her apartment from 25 years ago. I am wearing a plain blue shirt, and a pair of light khaki shorts. Not a frill or pattern visible. Then I need to decide if I am going to embellish the dress, or leave it as-is. . . . 25 years ago. . . . I am wearing a plain blue shirt, and a pair of light khaki shorts. Not a frill or pattern visible. I've never made so dramatic a style change myself, I've just gone from chic minimalism to smocks - but if it feels right then do it ! Dress is about half done... Lower half just needs the hemline edge bound. Upper half needs the sleeves attached, the buttonholes made, and the buttons attached. At that point, the bodice and skirt get stitched together and the dress is finished. I'm inclined towards the tiny* porcelain buttons, as they are a better color match. My concern is about how well they will hold up to being machine washed, but I imagine that as long as I am careful about turning the dress inside out before laundry they will be cushioned enough by the dress itself. Indgotiger, I love the porcelain button. It's very dainty but oh, so cool. To me, it seems more fitting with the fabric colors. Thanks Theresa... I am going to use those wee tiny buttons. Also I am trying to move past my "save this for the perfect thing" frame of mind to a "use this so that I can enjoy it now" attitude. I bought those buttons at the pottery guild show about ten years ago, and I think that they will bring me more joy actually on a dress than in the button box! Indigo, I love those little buttons...but they do look fragile. (and look like something you might use again once this dress wears out!). Do you know how to make removable buttons? I looked (fast) for something on the web and didn't find much. It's an old fashioned technique used before 1950s when washing was hard on textiles and buttons were real mother of pearl. It works best if yoûr buttons have a shank, but other kinds of buttons also can work. If it has a shank, and your machine will make eyelets...you're set. These end up pretty much like the buttons on men's (modern) tuxedo shirts. 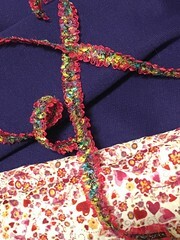 With no shank, you sew the buttons on a backing strip that goes under the facing, with a double set of buttonholes. There is a Threads article that explains this, but I can't get to it without a Threads subscription. If this isn't enough to get you going in the right direction...I'll look some more. Also, thinking about this, you could "up" the impact by the spacing of your buttons..maybe using two close together. Bessiecrocker - I am actually familiar with that technique, if only because I have a collection of Threads magazine that goes back to issue#1 (I don't subscribe any more, but what I do have takes up a whole shelf on my bookcase). I thought about doing that, and decided that it would make me nuts to double unbutton and button the top half of my dress. Instead, I plan on laundering it turned inside out, and since I have a front loading washer with a gentle cycle, it should be okay, particularly since the dress will hang to dry, not be sent round in the tumble dryer - I have washed an SCA dress with amber discs embroidered on it with no problem, and porcelain is a lot more robust than amber. If I had more of these buttons, arranging them in double button mode would indeed look great... unfortunately I only have five, which is just enough to close up the dress front. Next time I get fancy buttons, I will make sure to get more than five! wrap the buttons in aluminum foil before they go into the wash.
IndigoTiger - another vote for the procelain buttons, I think they are beautiful. For washing, I was thinking something like Bessie below. Or, maybe handwashing? The aluminum foil is a good cheap trick! I was thinking of the plastic clamshells you can buy. Indigo, I do love the tiny buttons as well! Bad news on my front, I tried on my dress and I do not like it. At all. It is a bit small, and the wool as I suspected does not have enough drape for the design. oh Wendy - I'm so sorry that your purple dress didn't turn out like you had hoped! Will you be able to salvage the pretty fabric for a future project? Matching the right fabric to the right pattern is always a bit chancy, even if the pattern gives "suggested fabric" options. Although the pattern text suggests either fabric with good drape, or fabric with more structure "like ikat or linen", I noticed that all the images of the dress show it made with very drapey fabrics... I'll wish very hard that you come up with an alternate dress for the challenge!! I am still hoping to join in. My dress screeched to a halt when I found out that the bust dart was wrong on the pattern tissue. I have been mulling over how to fix it for weeks. My first thought was to patch or somehow add back to the side seam area (iron-on interfacing? ), letting me recut it correctly, but I am not very good at mending. Plus the repair would coincide with the dart. My second thought was to the top of the dress off, and add a new piece to the top, making a bodice and a waist seam. (It is an apron dress, so there is no back.) But of course I don't quite have enough fabric to cut a new bodice. So I would have to add a small yoke as well to piece together enough fabric. Complications seem to multiply ...! Kushami...is this the dress we're talking about? Here's how I would fix this...open up the two "side seams" from the top to an inch or so below where the corrected dart will start. Inset extra fabric along the front seam edge, do your corrections, and mark where the side edges should now go. These inserts will end up looking like gussets that you intended to have. But you need to do the same on both sides...so it looks intended. You may have enough of the same dress fabric; you'll need only two long narrow pieces. Or use a coordinating fabric which will make this look like an intended accent bit on your dress. We all like the buttons! But getting rid of the extra dye makes me nervous. Why don't you do all that aggressive pre-washing--dye removal without the buttons sewn on? Simple to add the buttons once the dress is ready to wear. I'm glad you're using the porcelain buttons as well, indigotiger. They look so nice against that fabric. I'm with you, they should do well with washing if your dress is turned inside out. The important thing is that you got them out of your button box and onto a garment! They must love seeing the light of day. Page created in 0.153 seconds with 17 queries.